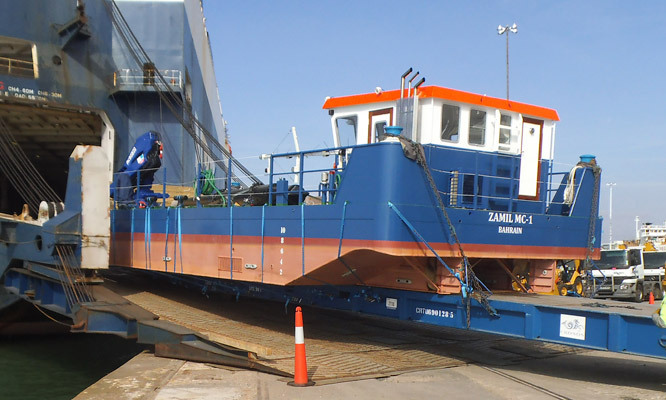 After leaving Meercat Boats as a new build in Southampton, the 15 metre 6 metre workboat was shipped directly to Dammam in Saudi Arabia on board a RoRo vessel, which thanks to its unique road transportable nature was easily achieved underdeck. The ability to launch the Meercat using the mothership’s crane was crucial to the project, with a strict weight budget to adhere to. Thanks to an aluminium wheelhouse the Meercat easily came in underweight. Powered by two Doosan L136Ti engines providing 460hp in total, giving speeds under load of up to 8.5 knots. The vessel’s crane was capable of 23t/m and it was supplied with a Beta Marine 21kVA generator and four hydraulic winch capstans. The Meercat RT15 multirole workboat immediately commenced work carrying out dive support in shallow water operations in and around Dammam and the Arabian Gulf.